So, next month is Valentines Day and my boyfriend and I have never really been a couple to go out and celebrate it. I think a lot of it stems from everyone slating it and rolling their eyes at anyone who does celebrate it but also our anniversary is in March and I think we've always celebrated that more as it's more personal to us. Either way, the older I am getting the more I am realising that you can do what you want! If you want to go out for a fancy dinner with your partner-do it! If you want to stay in and watch a film together-do it! If you love your partner and both agree to not do anything for Valentines-do it! Your relationship is personal to you both and that's the way it should stay so please don't ever feel like you can't celebrate or even not celebrate it because of what other people may think about you. This year if we decide to go out for Valentines I think we will decide to go to a nice restaurant. We are very lucky that we live so close to Cardiff where there are many beautiful restaurants and bars and I think this outfit would be perfect for that night out. This dress is so comfortable to wear and being velvet this 90's style is very on trend right now. I don't have any other dresses like this but I like that the top of the dress is almost halter neck so that you can still see the detail of the straps even when wearing a jacket. Did I mention this dress is just £10! I'm wearing my favourite black thigh high boots which are also very comfortable and give my 5"2 self a little boost! I've added my new Osprey bag with a silver chain which pairs perfectly with this velvet choker from Johnny Loves Rosie. Finally to make sure that I don't get too chilly (even after a wine or two!) 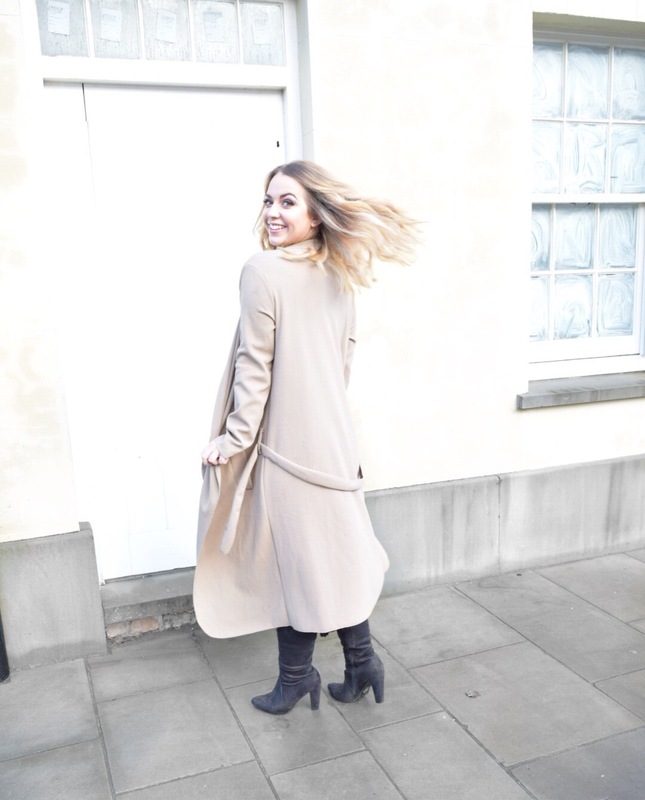 i've tried to dress the outfit down a little with this very cosy duster jacket from Boohoo. If I'm going to a restaurant then I don't want to feel too dressed up but as it's Valentines Day I do want to feel special! Whatever you decide to do for Valentines day I hope that you have a beautiful day and really enjoy yourself! *This dress was kindly sent to me from Boohoo as part of their "Dress of the month" campaign but all opinions are honest and true as always! Looking lovely girly, that dress is beautiful on you!